Russian Prime Minister Vladimir Putin responded Thursday to calls for a boycott of the Euro 2012 football championship in Ukraine over the case of jailed ex PM Yulia Tymoshenko by saying that sport and politics should not mix. 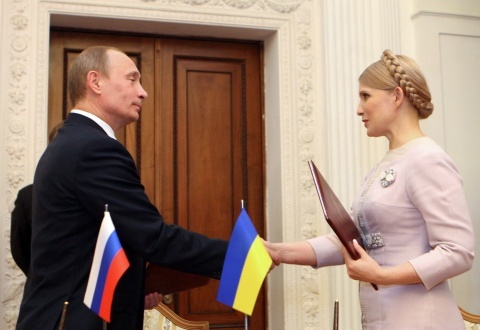 Putin also expressed Russia's readiness to accept "with pleasure" Tymoshenko for medical treatment, should the Ukrainian authorities agree. Tymoshenko has been sentenced to seven years in jail for abuse of power for making a natural gas supply contract with Russia's Prime Minister Vladimir Putin after the 2009 Russian-Ukrainian gas crisis, which is said to have been unfavorable for Ukraine. The jailed ex Prime Minister claims that her political rival, President Viktor Yanukovych, is using the country's judiciary to punish her. German Chancellor Angela Merkel reportedly threatened last week to ban her ministers from attending games in Ukraine, while European Commission President Jose Manuel Barroso has vowed to stay away amid concerns about the treatment of jailed opposition leader Yulia Tymoshenko, RIA Novosti reminds. "In absolutely every case, you can't mix politics, business and other issues with sport," Putin said when asked about the dispute at his residence outside Moscow. "I stick to the principle professed and supported by the International Olympic Committee – sport is outside politics." Poland is playing co-host with Ukraine for the Euro 2012 tournament, which begins June 8 and is considered one of Europe's most prestigious sporting events. Former Prime Minister Tymoshenko is serving a seven-year sentence for abuse of office, after what she claims was a politically motivated trial. Photographs last week appeared to show bruising on her body after she claimed that she had been beaten in jail. In Poland, which is co-hosting the tournament with Ukraine, the political classes are split over the question of a boycott. Earlier Monday, Polish opposition leader Jaroslaw Kaczynski called for a boycott of matches in Ukraine to protest the treatment of the country's imprisoned opposition politician Yulia Tymoshenko. Kaczynski suggested that games should be moved from Ukraine, although UEFA tournament director Martin Kallen appeared to rule this out in comments Monday. The comments put Kaczynski, head of the opposition Law and Justice party, at odds with Polish President Bronislaw Komorowski, who said a boycott was "inappropriate" in comments on Polish television Wednesday.